Electronic keyboards and synthesizers often contain hundreds or thousands of different sounds. Each sound is known as a patch. The name comes from the early days of synthesizers, for which you physically rewired (using patch cords) the oscillators and modulators to produce different sounds. Patches are normally organized into groups of 128, called banks. Most instruments have between 1 and 8 banks, but MIDI supports up to 16,384 banks of 128 patches each (that’s over 2 million patches).The Bank and Patch controls in the Console view and Track Inspector control the initial bank and patch of a track during playback. Every time SONAR starts playback at the beginning of a project, the bank and patch settings for the track are set to these initial values. Many instruments have descriptive names for their banks and patches. SONAR stores these names in an instrument definition. If you are using an instrument that supports General MIDI, your patch list will contain the 128 sounds that are defined by the General MIDI specification. Note: Different MIDI instruments use different types of commands to change banks. SONAR supports four common methods for changing banks. For information about the bank selection method you should use with your MIDI gear, see your MIDI equipment’s documentation. Tip: If your bank name is too long to fit in the Bank field, hold your cursor over the bank name. A tooltip appears with the complete bank name. Note that a single MIDI channel can only play one patch at a time on each instrument assigned to that channel. Therefore, if two or more MIDI tracks are set to the same output and channel but have different bank and patch settings, the patch of the highest-numbered track will be used for all the tracks. In some projects you want the sound played by a track to change while playback is in progress. You can accomplish this using the Insert > Bank/Patch Change command. When you start playback in the middle of a project, SONAR searches back through the track to find the correct patch to use—either the initial bank and patch or the most recent bank/patch change. Note that the Console view and Track Inspector only show the initial bank and patch, even while a different bank and patch are being played back. The only way to see and edit a bank/patch change is in the Event List view. For more information, see The Event List view. In the Track view or Console view, select the MIDI track or Simple Instrument track you want to configure. To select a track, click the track number. On the left side of SONAR is the Inspector (see Inspectors), which shows information about the selected track. If the Inspector is not visible, it may be either collapsed or closed. To show the Inspector, click the Views menu at the very top of SONAR, and select Inspector. For details, see “To show/hide the Inspector pane”. For MIDI tracks. In the Track Inspector’s IN / OUT section, click the Output control and select the desired synth or MIDI port from the drop-down menu. For Simple Instrument tracks. Simple Instrument tracks contain both audio and MIDI settings, so first click the MIDI tab in the bottom right of the Inspector to show MIDI settings. Next, click the Output control in the IN / OUT section and select the desired synth or MIDI port from the drop-down menu. The MIDI Channel, Bank and Patch settings are located on the left side of the Track Inspector, between the FX Rack and Mute/Solo/Record buttons. The controls are labeled “C,” “B” and “P”, respectively. Click the Channel control (“C”) and select the desired MIDI channel. This will set all MIDI data on this track to output on the selected channel. Click the Bank control (“B”) and select the desired bank. SONAR can display a hardware synth's banks and patches by name if you have assigned the corresponding instrument definition for your hardware synth. For details, see “To assign instrument definitions to MIDI outputs and channels”. 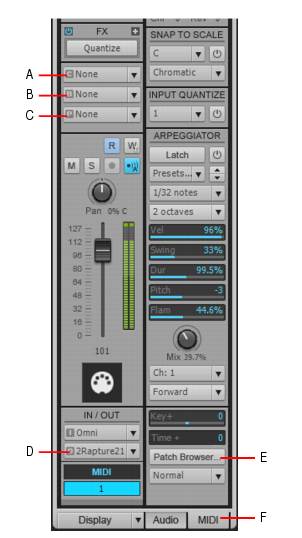 Note that VST soft synths often do not expose this information to SONAR. Click the Patch control (“P”) and select the desired patch (instrument). To search for a patch containing specific text, click the Patch Browser button in the Track Inspector. You can also open the Patch Browser by right-clicking a Bank or Patch control in the Track Inspector or Console view. For details, see To choose patches with the Patch browser. Figure 93. Track Inspector controls for MIDI tracks and Instrument tracks. Note: This feature is not available in SONAR Home Studio. Highlight the track whose bank and patch you want to change by clicking on the track number. Set the Now time to the time at which you want the change to occur. Choose Insert > Bank/Patch Change to display the Bank/Patch Change dialog box. Choose a bank and patch from the lists. SONAR inserts a change in bank and patch. When you play back the project, the initial bank and patch shown in the Track view will be used to the point at which the bank/patch change takes place. You can remove a bank/patch change in the Event List view. In the Track Inspector or Console view, right-click the patch name in the track module you want to change patches in. In the Track Inspector, click the Patch Browser button in the track you want to change patches in. The Patch browser dialog box appears, displaying a list of all the Instrument patch names that have been installed. Search for a patch name, if desired, by filling in text in the Search field at the top of the dialog box. When you find the right patch, click its name and click OK.
SONAR changes the patch of the track you selected.